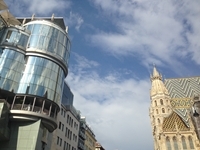 The city is also home to a wide variety of hotels, including the recently reopened Hilton Vienna Plaza, which has benefited from a €20 million renovation modernisation programme that has seen the entire hotel transformed into a glitzy art deco masterpiece, more of which anon. Vienna is rightly known as one of the most musical cities in the world, so walking its charming cobbled streets inevitably means exposure to many of the composers and musicians who were born here or lived within its walls. You won’t need to walk far before you’re offered seats at a Mozart, Beethoven, Strauss or Brahms concert and if you really want to treat yourself, a night at the Vienna State Opera will live long in the memory. Tickets can be pricy though and last minute availability varies depending on the popularity of the performance, but don’t be downhearted… Many of the operas are relayed onto a big screen outside the Opera House and a party atmosphere ensues. Of course, many cities around the globe can boast world class opera houses, but only Vienna is home to the world famous Vienna Boys’ Choir (www.wienersaengerknaben.at). Founded in 1498, the choir can normally be seen performing Sunday mass in the Burgkapelle and two-hour concerts are held on Friday evenings at the choir’s new home in the 400-seat MUTH concert hall. During our visit the choir was performing at the Spanish Riding School as part of an event billed as ‘A Tribute to Vienna.’ Of course the Spanish Riding School (www.srs.at) is home to the famous white Lipizzaner stallions and their dressage-like performances are billed as an unequalled equestrian show. Tickets for a ‘normal’ performance at the Spanish Rising School sell out months in advance and vary in cost depending on where you sit. The more expensive seats are at the lower level, adjacent to show ground with seats at the upper level costing less and the standing areas (behind the single row of seats) are significantly cheaper. We secured premium seats at a cost of around €80 per head but were very disappointed at both the length of the performance and the general conduct of the audience. The standing areas were full of students, who had paid a fraction of the price of those sitting in front of them, but felt it acceptable to both push past the seated guests and talk incessantly through the performance. Sadly the stewards were only interested in stopping people taking photographs (presumably to protect merchandise sales) and even complaints by our fellow viewers fell on deaf ears. Regretfully, a lot of Vienna’s attractions are priced to maximise income from the captive tourist, often with a sliding scale of charge to catch out the unwary. A visit to the rococo former royal summer palaces at Schloss Schönbrunn (www.schoenbrunn.at) is a must, but if you want to visit all the buildings – the look-out tower, kitchens, etc. – the cost can soon ramp up. At least the gardens are free and the tea room in the Gloriette rewards those who walk up the steep hill with incredible views. 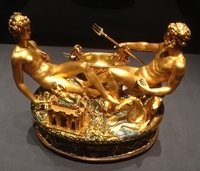 There are a number of former palaces and royal residences to visit but, in our opinion, by far the most enjoyable is Schloss Belvedere (www.belvedere.at). The baroque mansion is today home to one of the most incredible collections of artwork including masterpieces by Monet, Van Gough, Renoir and Degas. However, it is the collection of Gustav Klimt pieces that is the main attraction, particularly his famous 1908 painting The Kiss. 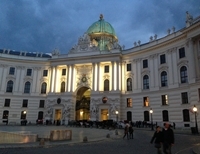 During your visit be sure to take in the Lower Belvedere palace and its collection of modern art. I have to admit to a soft-spot for contemporary art and some of the exhibits here are incredibly powerful. However, if there’s one thing I like more than contemporary artwork, it is contemporary restaurants and in this respect Vienna does not disappoint. You’ll be spoiled for choice for restaurants, ranging from rustic pubs serving traditional Austrian faire through to fine dining restaurants aplenty. 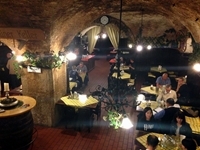 We particularly enjoyed the Wiener Schnitzel at the charmingingly cellar-located Melker Stiftskeller (www.melkerstiftskeller.at) . No visit to Vienna would be complete without a visit to the restaurant at Hotel Sacher (www.sacher.com), not least to sample its trademarked Sacher Torte. A meal here is a treat to behold with the stunning food bettered only by first class service. Given how impressed we were by Hotel Sacher, it is praise indeed to say that the meal we enjoyed in the Wienerin bar/restaurant (www.wienerin.org) was one of the finest we’ve enjoyed anywhere in the world. The ambience of this friendly bar combined with some truly inventive food made this a night that will live long in the memory. The city is rightly famous for its café culture and visitors are spoiled for choice of fine establishments serving sumptuous Viennese cakes and the finest coffee. 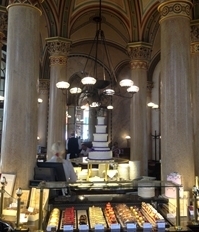 Our first point of call was Café Central (www.palaisevents.at/en/cafecentral); the legendary literary café that opened in 1876 and boasts architecture that is almost as impressive as its pastries! Today the establishment is a popular haunt for locals and tourists alike but at the turn of the 20th century it was a popular meeting point for leading lights in the world of art, literature, politics and science, including Sigmund Freud, Peter Altenberg and Leo Trotzki. Turn up early for breakfast or expect to queue out of the door. Alternatively, try Café Landtmann (www.landtmann.at), which equals (perhaps surpasses) the quality of food but lacks the famous past patrons. 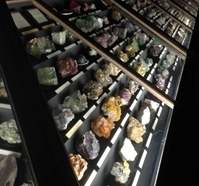 Of course there’s more to do in Vienna than eat, and the Museums District is home to some very memorable – although at times overwhelming – collections of artefacts. The Kunsthistorisches Museum (www.khm.at) is vast and includes an impressive variety of Egyptian, Greek and Roman antiquities as well as all manner of curiosities. It is also home to an abundant exhibition of artwork on the second floor, although the majority of this is from the ‘medieval religious’ genre and therefore perhaps not to every visitor's taste. If German is not your strong suit you’d be advised to spend a few extra Euros at both of these museums and invest in the audio guides as English signage on the exhibits is often limited. A short walk from the museums is the Hofburg palace, the Rathaus, parliament buildings and the Monument Against War and Fascism. In fact the entire city is eminently walk-able, but for those wanting to rest their feet a series of trams and the U-Bahn underground trains make it easy. Tickets can be purchased on the platforms or on the trams/trains and while you do not need to validate your ticket, be warned that ticket inspectors are commonplace. A week-long ticket costs around €15 and is valid on both trams and the U-Bahn, so if you plan to use the transport network regularly this should be a priority purchase upon your arrival in the Vienna. 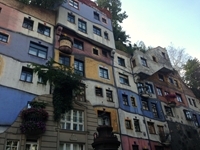 The U-Bahn will give you access to one of the most amazing sights in Vienna – the Hundertwasserhaus. This curvy block of flats was designed by radical Viennese artist Friedensreich Hundertwasser and boasts lurid coloured walls and mosaics aplenty. You can’t tour the inside of the flats nowadays but be sure to check out the Kalke Village (www.hundertwasser-village.com) across the road for the full story. Trust us, it’s one of Vienna’s unsung highlights. As mentioned earlier there is no shortage of quality accommodation in the Austrian capital, but we enjoyed a very pleasant stay in the newly reopened Hilton Vienna Plaza (www3.hilton.com) – itself just a two-minute walk from a U-Bahn station. The recent re-design includes all 254 rooms and suites at the hotel and was conducted under the guidance of Robert Angell, the prestigious London-based design studio. Inspired by the architectural history of the building, the hotel has been developed with a stylish art deco theme throughout its rooms, meeting facilities and public areas. This is characterised by stylised geometrical designs and artwork created in the Wiener Werkstätte style. Prominent architects of the early 1920s – especially Adolf Loos and Joseph Hoffmann – served as important sources of inspiration. Marble adds a timeless elegance to the guest bathrooms and the Hilton Serenity bed is one of the most comfortable hotel beds we can recall sleeping in for a long time. The hotel’s ten suites on the Penthouse Floor feature private balconies with beautiful views over the city and the makeover extends to the ten conference rooms. 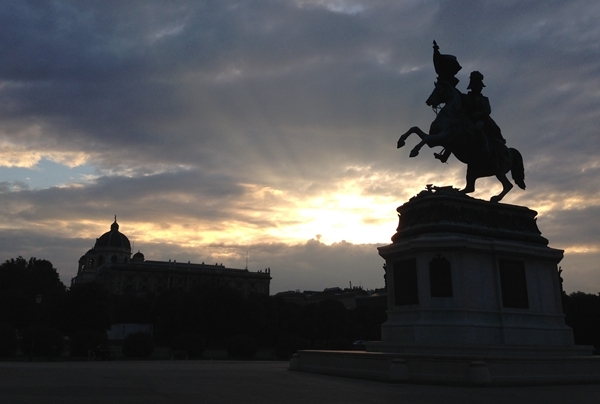 Vienna is a city of varied artistic, architectural, musical and gastronomic highlights. It is also awash with an amazing array of shops – including Tiffany’s, Gucci and all the big name luxury brands you’d associate with a city this glamorous. 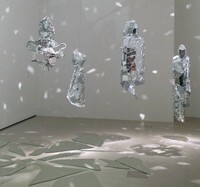 There are notable independent stores such as Schwäbische Jungfrau (www.schwaebische-jungfrau.at), which has been producing luxury table and bed linen for the rich and famous since 1720 and Gallery Sikabonyi (www.the-glassplace.com) which sells the most incredible contemporary glass art. Combine these with a typical Austrian Christmas market, some gingerbread and maybe a glass or two of schnapps and you have the recipe for a memorable festive break in the Austrian capital!